The Vigo Cies Islands ferry route connects Spain with Spain and is currently operated by 2 ferry companies. 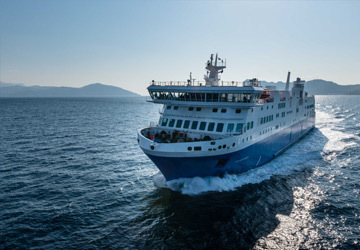 The Naviera Nabia service runs up to 5 times per day with a sailing duration of around 40 minutes while the Mar de Ons service runs up to 9 times per week with a duration from 45 min. So that’s a combined 44 sailings on offer per week on the Vigo Cies Islands route between Spain and Spain. Compare now and get the best fare at the time that you want to travel. Iberian Spain’s most westernmost city, Vigo is situated on the edge of the Atlantic Ocean and is surrounded by a spectacular mountain landscape. This historic and cultured city is steeped in tradition and is also home to Europe’s largest fishing fleet. The city centre is perfect for walks down narrow winding streets, whilst at night it comes alive with lively tapas bars, sumptuous seafood restaurants and buzzing bars and clubs. Vigo is the gateway to Illas Cíes or the Cies Islands with ships leaving the port at least four times daily, with the crossing taking around 45 minutes. The port area has been redeveloped in recent years with a shopping mall in close proximity to the dock. However, Muelle de Transatlanticos, where the ships set from, is located just in front of the fortress city. You’ll find it a short walk down the palm tree-lined Avenida del Catillo waterfront promenade to the city centre. The terminal itself has a small amount of shops and a café with Wi-Fi connection on the first floor. The Cies Islands comprise a trio of Spanish gems boasting some of the finest beaches in Galicia, lying a short ferry ride from the port town of Vigo. Sailings to the archipelago usually take around 40-45 minutes, running up to four times daily, making them a popular daytrip destination. Pristine and vehicle-free, the Cies Islands represent one of the best choices for nature-lovers looking for a slice of untouched Spain. Whiling the days away on immaculate sandy beaches is the biggest draw, with the crescent-shaped Praia das Rodas stretching for one glorious kilometre. Tired of sunbathing? Challenge yourself and the family along one of the many hiking trails, the most popular being the Ruta Monte Faro. This route displays the very best scenery the Cies Islands have to offer, also taking you atop the most breath-taking viewing points.